Lilies are bulb plants that are desirable for their hardiness and beauty. Many varieties spread rapidly, such as the day lily, and some can grow in deep shade (lily-of-the-valley) or even the water, such as water lilies. Lilies are often grown to be used as cut flowers, and they are notoriously easy to grow. For these reasons, lilies are a favorite of many home gardeners and florists. There are two types of lily bulbs: Rhizomatous and concentric. Rhizomes are horizontal bulbs that spread underground to form new bulbs. 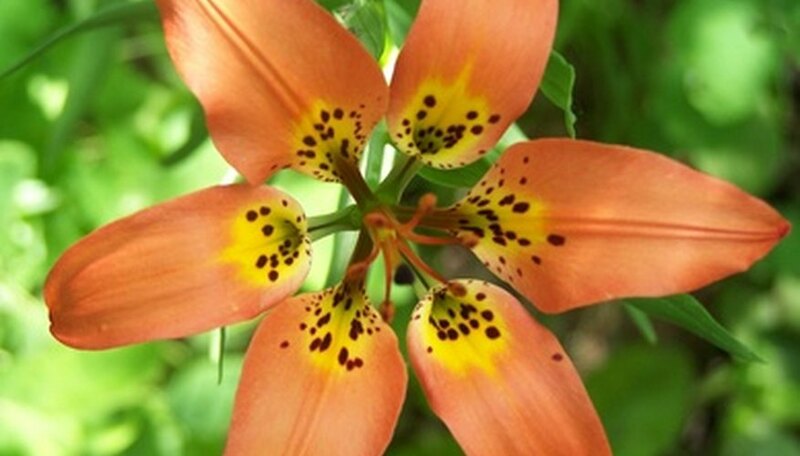 These types of lilies often form huge colonies and tend to grow wild in fields and forests. Concentric bulbs retain their distinctive, tear-drop shape and form small new bulbs (sometimes called "daughter" bulbs) close to the axis. The bulb contains the embryo of the plant, including all parts of the flower, as well as nutrients stored to nurture the plant until the roots can fully develop. The basal roots of the lily extend downward and horizontally from the bulb. These stabilize the plant in the soil. Small root hairs branch off from the stem directly above the bulb, and it is these roots that obtain much of the minerals and water from the soil. For this reason, lily bulbs need to be planted much deeper than many other bulb flowers. The stem sprouts from the top of the bulb or rhizome. Once it reaches the surface of the ground, it grows vertically. The leaves sprout from the stem and vary widely according to species. Some are long and slender, while others twist around the stem. Water lilies have flat, wide leaves. The inflorescence refers to that part of the lily plant that houses the flower and reproductive organs. In some lilies, these appear as tight green buds perched on top of a tall stem. In others, the inflorescence grows at the end of several small stems branching out from the main stem of the flower. Lily flowers are composed of petals, which come in many colors from bright white to yellow, red or orange, although none are blue. In some lilies, the petals are grouped tightly together, forming a trumpet-shaped flower. In others, the petals are almost flat. These are called bowl lilies. The final shape is called a Turk's Cap, and occurs when the petals curl backward towards the stem. Nestled in the middle of the petals rise six stamen. These contain the pollen needed to reproduce. They rise up from the pistil, which contains the female reproductive parts of the lily. Below the pistil is the ovary, which contains the seeds.